Do you cover your microphones when they’re not in use? Good mics are precision instruments, built to tight tolerances. They’ll last a long time if they’re taken care of. 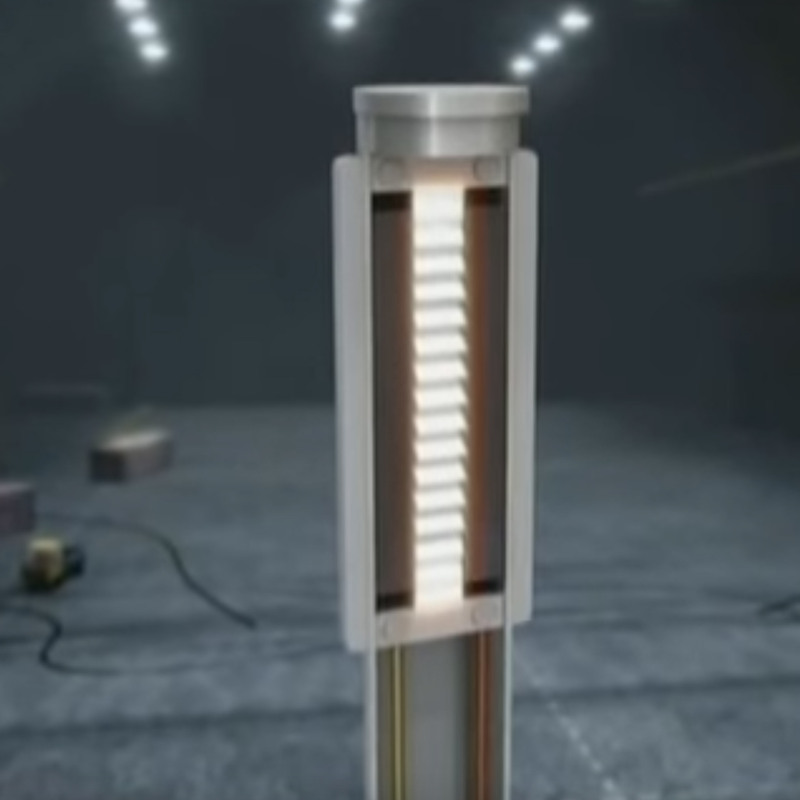 Yet they’re susceptible to environmental damage — condensation and moisture, dust and smoke, gusts of air. Once they get dirty, they’re hard to clean. Putting mics away after every session is a hassle. It takes time, and wears out the threads, clips, and connectors. Add to that the risk of dropping the mic in transit, and the idea of leaving mics set up becomes more attractive. But what’s the best way to protect them? The ubiquitous purple Crown Royal bags? Ziplock sandwich bags? Stocking caps? At beSharp, mics are almost always put away after a session unless the same setup is being used the following day and nothing else will be going on until then. The mics aren’t specifically covered with anything in those instances. Occasionally, if we’re doing a bunch of drum sessions over the course of several days, the dynamic mics (SM57s, D112s, MD421s, etc.) tend to stay on their stands for the week but are never covered. During album projects where a condenser mic is set up in the isolation booth for scratch vocals, we tend to keep it set up for the entire week as well. In those cases, the mics are usually covered with either a foam windscreen for the duration or a mic sock at the end of each day. I have a couple of velvet socks from Audio-Technica that I use for any given brand of condenser. (via Twitter) leave em out. If it is a tube mic turned off and unplugged at night. Really expensive one gets a baggy over it once its cold. (via Twitter) if I can I remove any mics from stands, if not I cover them with small towels, just to keep the dust off. It would depend on what mics I was using. My assistant usually covers the vintage mics, and we just leave the other stuff alone… like the U47’s and the M49’s and U67’s get covered by a variety of things, like a sandwich bag or a fabric sleeve (like a custom made crown royal bag)… but usually, I will just leave the mics as is. No cover. I even have video of people blowing smoke into my U47…. but when it is Mos Def, I don’t even think twice about it. I just wanna hear great music and use my tools to get the job done. Yes, I usually, at the end of a session day, will but a plastic baggie loosely over at least the capsule part of the microphone. When I put the mics away, I will put them in a baggie first, then the box or whatever, and I do keep silica gel paks in the case. 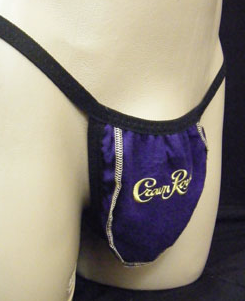 I have heard of some people using Crown Royal purple cloth bags, but I wonder about lint from those, plus I don’t drink. How Crown Royal got to be so popular as a manufacturer of microphone covers remains a mystery. For what it’s worth, you can buy those bags in bulk on Ebay for about $0.30/bag, but, like Mr. Manning, I would be cautious of lint, as well as the implication to clients that you actually drank all that whisky. Besides, you don’t know where those bags have been. Anyway, this panel of experts agrees that at least the nicer mics in the locker deserve some sort of cover — a foam windscreen, velour hood, canvas sack, or even a sandwich bag. In an industry that embraces DIY, it’s no surprise that the list of recommended products is as long as the list of engineers making the recommendations! 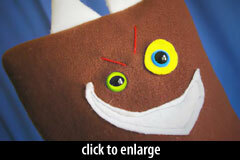 I recently learned about a new product in this under-served niche: Mic Monsters! 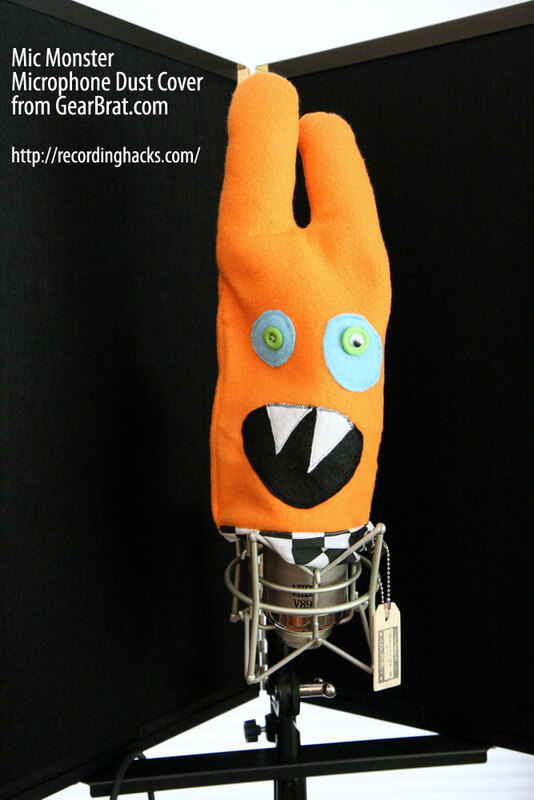 Mic Monsters are microphone covers with character. 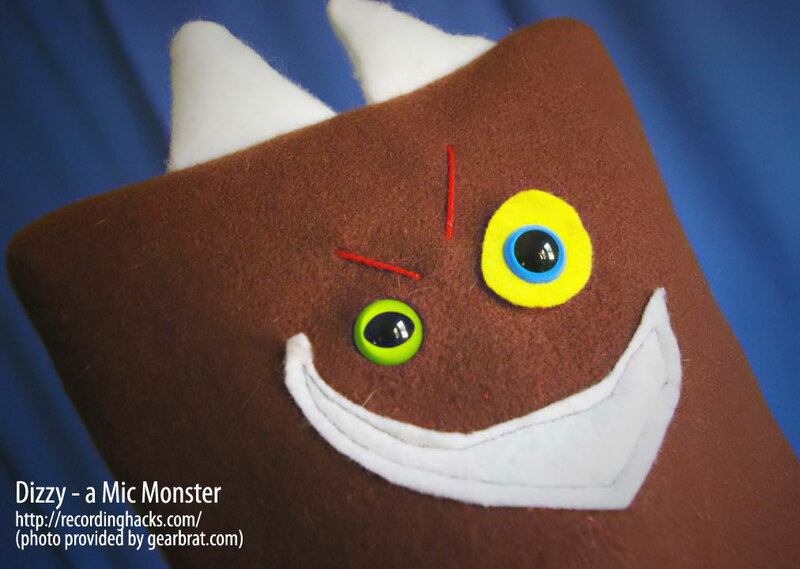 Invented by Gearbrat.com founder Josh Miethe, Mic Monsters are conceived and produced by hand in Champaign, Illinois, in at least 18 different guises. Each one is lined with clear vinyl, eliminating the risk of the outside material shedding into your mic’s headbasket, as well as preventing infiltration by particulate contaminants. 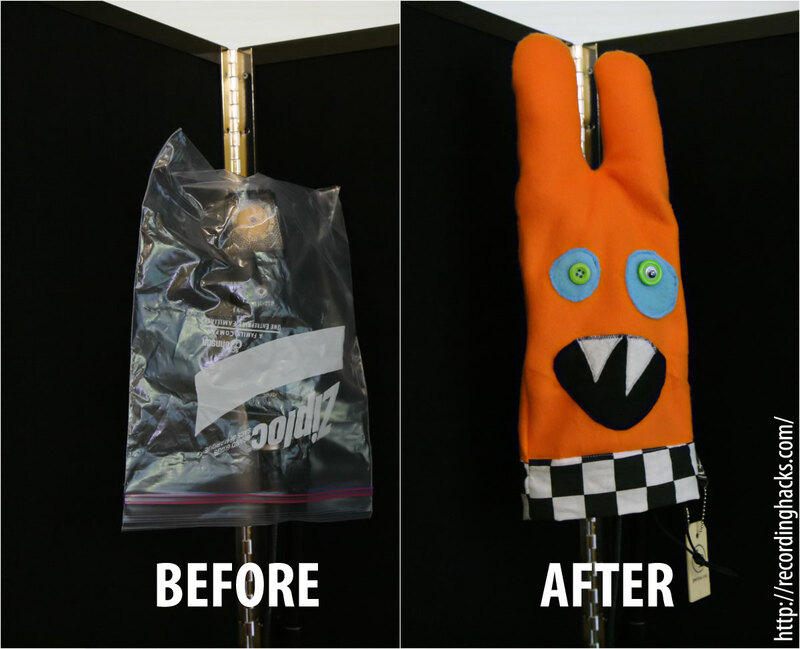 Each one has a drawstring closure at the bottom, allowing the monster to be cinched tight to seal out dust — which means these double as storage bags when the mics go back in the locker. They come in a variety of sizes, although just about any of them will cover at least the capsule end of any mic you own. Josh sent me a one-off monster to introduce the new product line. Meet the psychotic rabbit who shall henceforth be guarding my best microphones! The Monster seems to be well-made. All the seams are thoroughly stitched. The drawstring closure is simple and functional. The clear vinyl that lines the body cavity is a great idea. I love handmade gear, especially handmade gear I can afford. And I have a ton of respect for tiny companies that make quirky and useful products. 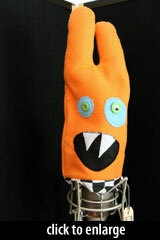 I’m digging my Mic Monster, and I’m happy to endorse them. The Monster provides a distinct upgrade from my previous mic cover. See for yourself — only one of these contributes to the vibe of my room. Retail prices range from $25-$35, depending on the complexity of the Monster’s design. Given the prices, I think these would make great gifts — a studio accessory someone can actually afford. I have to confess that Josh didn’t send me just one mic cover. He knows I’m a drummer, and therefore that I am blessed with an excuse for accumulating lots and lots of microphones. He sent a matched stereo pair of covers for my overhead mics, personalized with my very own logo on the front! These are apparently yet-another new option in the product line: microphone bags personalized for your club, brand, band, or studio. Josh used the low-res logo from the masthead of this website, and the result looks great. GearBrat can print photos, too. These mic bags are way classier than your dishtowels, stocking caps, and yes, even your booze sacks. Better for your microphones, too. 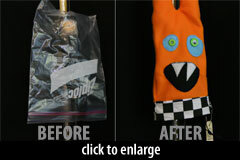 So if monsters aren’t your thing, check out the plain and personalized bags — they’re well-designed and beautifully made. Kudos to the GearBrat team for giving studio folks all these great options. The plain mic bags come in two sizes — small ($10 introductory price) and large ($20). Personalization likely costs more… call GearBrat.com at 877-559-7368 for details. As noted above, the Mic Monster and the pair of microphone bags from GearBrat.com were sent as a gift. I’ve since ordered two more mic bags through the GearBrat website, because I have more mics than cases. I’ve been needing some storage bags, and these seem to be ideal. Thanks to the excellent panel of audio engineers and producers for sharing their insights about mic protection: Slau, Ben, Joe, Joel, Pete, and Terry. And special thanks to Josh and the gang at GearBrat.com for the killer gift! I collect the shoe polish mitts from hotels when I travel. They are generally a low lint flannel-ish off-white stuff, not as big as Crown Royal bag but big enough to cover the grill of most mics. Oh yeah, I collect them, but rarely use them. I’m looking at an uncovered vocal condenser mic still set up from last week even as I type. Very old Neumann mics, circa early 60’s, came with a purple flannel bag, I remember seeing a few in the jewel case boxes. Maybe that’s where the Crown Royal idea came from. 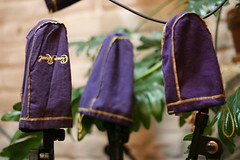 My dad was a Crown Royal drinker, so I have a few of those old bags covering mics. I always put a windscreen over the mic, then cover them with a Crown Royal bag and a baggie sealed in with one of these silica gel crystal packs from; http://www.micromark.com/SearchResult.aspx?deptIdFilter=0&searchPhrase=Rust+preventer. They can be put in the oven and refreshed, over and over again.